Before deciding to bring home a new puppy, do the research on the breed that would best fit your lifestyle. Go to some dog shows; visit websites; visit breeders; talk to veterinarians; visit clubs and trainers. There are some resources we recommend here. Dogs are awesome teachers, if you pay attention. Body language, eye contact, tone of "voice" - these things and more, when observed, can tell you so much about a dog and how it views you. Every dog is unique and relates to everybody in its "pack" differently. If a Tejas Bullie is in your future, we are just as eager to speak with you as you are in bringing home your new family member. Let's talk! Furthermore, advice and support are just an email or phone call away. From the best food, to how to trim those odd toenails (Dremel tool! ), our Bullies have taught us well over the years. Every Tejas Bullies litter is registered with the American Kennel Club. We provide new owners with the AKC paperwork to register their dog, in their name, with full rights. We do strongly recommend to buyers of puppies to have them neutered / spayed prior to eight months of age, unless the puppy is being purchased specifically for breeding or show purposes. 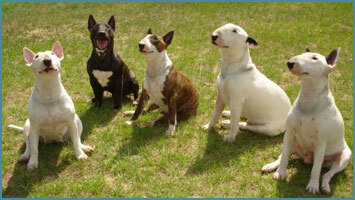 Every Tejas Bullies dog and puppy is up to date on vaccinations, worming and heartworm preventative. New owners will receive a Health Certificate for their pup from a licensed, certified veterinarian. Tejas Bullies guarantees puppies to be in perfect health to the best of our knowledge at the time of sale, and/or have fully disclosed any/all known concerns to the purchaser. We can not guarantee size or color upon maturity. The buyer assumes all responsibilities of the puppy, including medical expenses, when the buyer takes possession. The buyer will take the puppy or dog to a veterinarian of their choice within 3 days of possession for examination. The buyer will ensure all first-year shots are completed. Puppies are guaranteed for two years against any genetic disorder. This Guarantee & Agreement document is made available on this site; it is required to be signed by both parties prior to transfer of ownership, and necessary in order for the purchaser to receive their pup's AKC pedigree registration. *We book United Airlines exclusively when we must ship. Their PetSafe® program and QuickPak® service has provided for us safe, sane, efficient delivery from coast to coast. *We book the flight; provide the health certificate, crate, pad, food and water, contact phone number, and departure / arrival updates. *Shipping in this manner starts at $425.00 to the purchaser. *Puppies do not leave us until they are a minimum of eight weeks of age. *We require a non-refundable $500 deposit, which is deducted from the final sale price. This will hold your pup up to 10 weeks of age, or, if older, for two weeks from receipt of deposit. Full payment must be received and processed prior to change of ownership. *We accept Paypal and purchaser's bank money orders. The American dollar, too, is still welcome here. Buyer is responsible for Paypal fees. *Puppy prices will vary; generally between $1,250.00 to $1,800.00, depending on color, conformation and pedigree. Prices will be listed with pictures on the Puppies page.